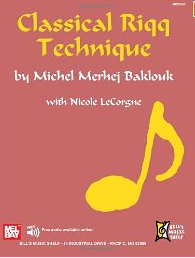 Built around the life and teachings of master percussionist, Michel Merhej Baklouk, this book has been designed as a biographical tribute, a teaching manual, and a resource guide for anyone wishing to develop a deeper understanding of the role that percussion plays in Near Eastern Arabic music. This book differs from most technique manuals in that it includes historical information on about Arabic music as it pertains to the life and work of a single artist, Michel Merhej Baklouk. The book is composed of three parts: Introduction, Lessons, and Reference Information. Each part is written to stand on its own as well as fit with the whole so that readers can approach the book either as individual articles and lessons, or in its entirety, to be read from cover to cover. By presenting Michel's work in this way, we hope to appeal to a wider audience—percussion students at varying skill levels and from varying music disciplines and backgrounds, students of music and Middle Eastern studies, or anyone else interested in twentieth century Arab music and culture. The first part, Introduction, contains several essays about Michel's life, his teaching philosophy, pedagogical practices, musical aesthetics and performance practices. Although these sections may be read independently, they are also designed to help percussion students apply the book's lessons to their own playing and musical interpretations. The technical focus of this book is on the riqq; however, students of Arabic music (beginning through advanced) can adapt the practical exercises to gain mastery of the percussion instrument(s) of their choice.